Emerald tumbled healing gemstones with natural swirls of green, mingled with veins of black, grey and white. This precious stone is shown with its impurities as it is found in nature. These vary in size: 3/8 inch and up. I consider these a 'rough' tumbled in that many retain some of their natural crystal shapes. Emerald helps us to overcome misfortunes and blows dealt by fate. It assists in bringing about a balanced nature, being open to, and accepting recovery. Detoxifies negativity and transforms that negativity into positive emotional energy. Stabilizes and soothes, offers a sense of security, harmony and closeness to the Goddess. Increases understanding of life purpose in relation to the universal plan, aids in emotional and life transitions and change. Emerald has a hexagonal crystal system and is in the mineral class of ring silicates in the beryl family. It is formed in a magmatic process, in pegmatites or through metamorphosis in the contact zone between rocks that contain berylium and chromium. 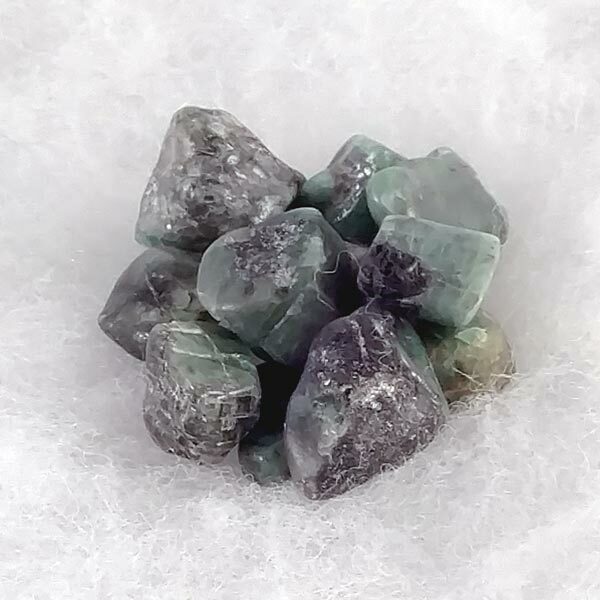 Coming from the beryl family which also brings us Aquamarine, it can be found in shades of green varying from light to dark. I should mention that there have been some healing benefits from the man-made types (found in most of today's fine jewelry), but nothing as beneficial as a natural stone. Our bodies find it much more difficult to assimilate the energy of the man-made types, and of course they do not contain all the extra elements supplied by naturally formed gems. Emerald may be worn, laid upon the body or used for meditation. When used as an essence it has a very pronounced effect. And yes, this is one of the few "green" stones that is ok to use in making an elixer. Emerald encourages spiritual growth, a sense of harmony, beauty, justice and clairvoyance. It assists us in being upright, goal oriented and life affirming. It can enhance friendship, love and unity between partners, and helps us to stay mentally young. Emerald helps us to overcome misfortunes and blows dealt by fate. It assists in bringing about a balanced nature, being open to, and accepting recovery. It can also stimulate regeneration and assist us in living intensely and to enjoy life. Emerald brings clarity, wakefulness and a broad vision. It definitely improves cooperation in group ventures (I've tried this several times with good success) because it promotes mutual understanding. 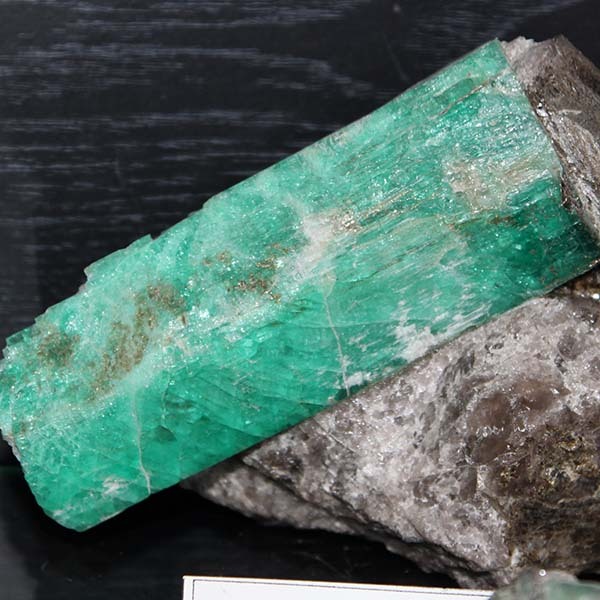 Emerald improves the ability to see and heals inflammation of sinuses and upper respiratory tract. It fortifies the heart, stimulates the liver, has a detoxifying effect and can alleviate rheumatic symptoms. Emerald also strengthens the immune system and encourages recovery after infectious illnesses. Emerald has an affinity with Cancer, Taurus and Libra. The deeper colors attune well to Taurus and Scorpio. Its Energy is Receptive, its Planet is Venus and its Element is Earth. There are some old accounts that tell about Emerald being brought to earth by the Lords of Flame from the planet Venus. Despite this unauthenticated origin, Emerald is an important stone to anyone who works in science or healing. Emeralds are often times used in business spells and rituals to promote sales and to increase a public awareness of a company or service. In ancient times, there are accounts of this stone being bound to the left arm to guard travelers. I have to say I prefer Turquoise for that task though. It had also been given to those considered to be possessed to exorcise the evil within them. In later times it has been discovered that those persons may have been epileptic or asthmatic and probably not possessed.